There’s a whiff of new high-end GPUs in the air, and before they reach us, we want to take another look at NVIDIA’s ~$200 GeForce GTX 960. This one comes from EVGA, and is called the SuperSC. It boasts a factory overclock, as well as the company’s advanced ACX 2.0 cooler. How does it fare, and can it be pushed further? Read on. In advance of the launch of some new high-end graphics cards, I wanted to take a fresh look at two sweet-spot (~$200) models: AMD’s Radeon R9 285 and NVIDIA’s GeForce GTX 960. Unfortunately, I didn’t receive the 285 I was waiting for before the 960 was fully benched with its results exported to graphs, so I will take a look at AMD’s offering in the very near-future. Fortunately, we still have the results from our original 285 review for the sake of comparison. As of the time of writing, the GTX 960 is the lowest-end part in NVIDIA’s Maxwell lineup, and matches up best against AMD’s aforementioned R9 285. From what I’ve seen, the R9 285 does tend to cost a bit less, with more models bundling mail-in rebates to make the price/perf ratio look very tempting. Who both of these cards are designed for are those looking to max out their games at 1080p, or achieve good detail levels at 1440p. I wouldn’t recommend toying with the idea of running this card for 4K gaming, unless the game is quite modest. Furthering that, if you ever plan to go the SLI route to make 4K a reality, I highly recommend opting for a 4GB, as 2GB is going to prove a severe limitation in certain games. EVGA offers 4GB variants of each one of its GTX 960 models, as we’ll see in a moment. Based on the paper specs, the GTX 960 is one-half of a GTX 980. Cores are halved, as is the memory and memory bus. Core and memory clocks are left in tact, whereas the TDP drops 45W to settle in at 120W. That might not seem too significant, but consider the fact that the 960’s predecessor, the GTX 760, had a TDP of 170W. In typical EVGA fashion, there are many different GTX 960 SKUs to choose from. All but the Superclocked models include the company’s ACX 2.0 cooler, and are 10.1-inches in length. The Superclocked, meanwhile, are shorter, at 6.8-inch, and utilize a single fan cooling solution. As seen in the table below, each respective edition shares the same clocks between the 2GB and 4GB variants. The standard edition GTX 960 carries an SRP of $209, while this SuperSC 2GB model I’m looking at is priced at… $209. In fact, as I write this, it’s $199 at Newegg, with a mail-in rebate bringing it down to $189. Why the SuperSC edition costs the same as the original, I’m not sure. Maybe it’s best to not ask questions. 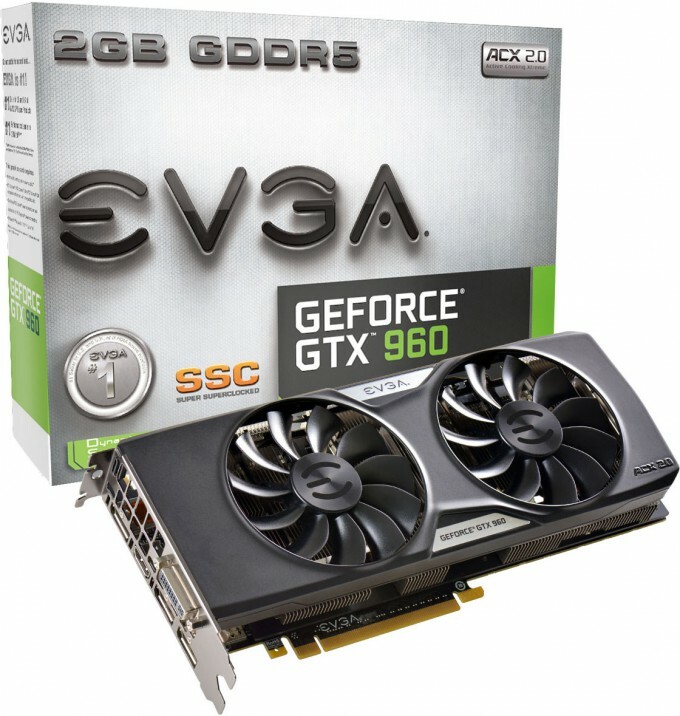 Overall, EVGA’s entire GTX 960 line ranges from $209 to $259. It’s worth noting that as of the time of writing, any GTX 960 purchase qualifies you for a free copy of The Witcher 3: Wild Hunt. If you want to take advantage of this, I don’t recommend wasting much time, as these promotions are truly “while supplies last”. As mentioned, the SuperSC edition of EVGA’s GTX 960 I’m looking at features what the company calls the “best graphics card cooler ever made”, or in simpler terms, ACX 2.0. It offers “swept” fan blades, double ball bearings, and a low-power motor – all equating to more airflow for less power draw. Efficiency aside, the cooler doesn’t look too bad, either. A nice touch seen on this card is protectors on all of the video connectors, the PCI contacts, and the SLI bridge. I am not sure I’d venture to call this feature “important”, but it does give the impression of this being a high quality part. On the topic of video ports, this particular GTX 960 has a single DVI, single HDMI, and triple DisplayPort. If VGA is required for some unfortunate reason, an adapter is included. Also included is an 8-pin to dual 6-pin adapter, as well as documentation, and even an EVGA poster. 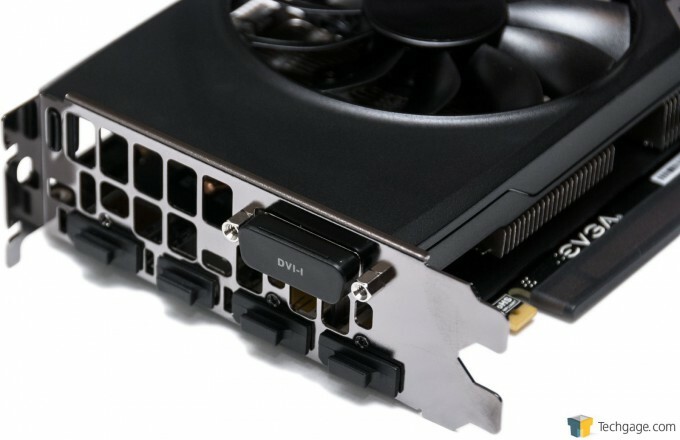 The reference GTX 960 is designed around having only a single 6-pin power connector, but due to the higher clocks on this SuperSC model, and not to mention user desire to overclock further, EVGA has bumped that to an 8-pin connector. The back of this GTX 960 does a great job of fulfilling its duty of being the back of a graphics card. EVGA’s GTX 960 SuperSC edition doesn’t offer many surprises, but instead continues to deliver what we’d expect to see. It’s sleek, attractive, and somehow costs the same as a regular-clocked GTX 960. Not bad. Let’s see how it fares in our performance benchmarks.